A weekly’s front page demand for action after its patch’s biggest residential fire since the Blitz has seen a council pledge a review of building regulations. 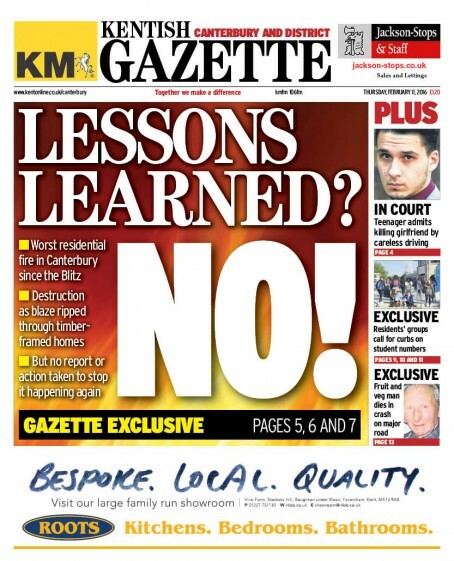 The KM Group-owned Kentish Gazette, which covers Canterbury, discovered neither Canterbury City Council nor the Kent Fire and Rescue Service had compiled an official report into a fire in June last year which left homes completely destroyed and a further 29 badly damaged. Miraculously no one was killed when the blaze ripped through the multi-storey timber-framed Tannery development. But the Gazette exclusively revealed on Thursday’s front page, pictured below, no action had been taken to stop a repeat of the fire. An editorial in the newspaper read: “Nobody is suggesting the construction hadn’t complied with building regulations. It’s the fact that it had complied with them that’s staggering. “Not unlike many new-builds across the nation, the city’s Tannery complex is of timber-framed construction and does not have sprinkler systems. “Given the speed at which the fire spread, you would think at the very least the construction method would be reviewed. Not so. Indeed the homes destroyed are set to be rebuilt to the same specification, we have previously been told. “The fire service says it was unable to say for certain how the blaze started. Beyond that, it’s ‘not its remit’ to investigate. The council says its responsibility did not extend beyond helping the families displaced by the fire. “We say the whole situation beggars belief. What will it take for investigations to be conducted, for reports to be prepared, and for recommendations to follow? Hours after the Gazette hit the newsstands the city council’s policy and resources committee agreed that building regulations should be reviewed. The authority is now vowing to put pressure on central government to make sprinklers a requirement of all new multi-storey timber-framed building schemes. Members have also agreed that planners will strongly recommend new developments in the district are fitted with the life-saving devices. In the aftermath of the fire, the Gazette launched a campaign to raise £10,000 to help the families affected, and the appeal raised almost £15,000 within a month. Editor Leo Whitlock said: “The team has followed this story closely ever since the blaze broke out. “They should be commended for their dogged determination to get answers and for uncovering the fact there was no official report into the blaze or into how to stop it happening again. Good work Leo, I am glad to have worked on this story with the team. An investigation is most definitely required regarding this major incident. It’s good to hear that the council is seemingly now seeking policy review after this latest front page. Fantastic example of regional journalism at its best. Congratulations Leo and your team.